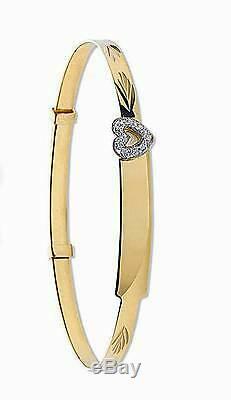 9CT GOLD BABY EXPANDABLE ID IDENTITY CZ HEART CROSS BANGLE FREE ENGRAVING BOXED. 9CT YELLOW OR WHITE GOLD. 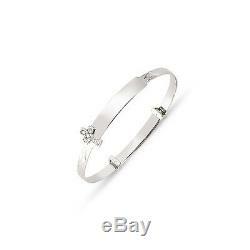 5.5DIAMOND CUT EXPANDABLE BABY IDENTITY BANGLE WITH CUBIC ZIRCONIA MOTIF. CHOICE OF CZ HEART OR CROSS. FREE ENGRAVING UP TO 10 LETTERS ON FRONT OF ID. CHOICE OF FONT ; BLOCK OR SCRIPT. PLEASE REQUEST THE NAME REQUIRED AND FONT STYLE IN COMMENTS BOX AT CHECKOUT. PLEASE ENSURE TO CHECK SPELLING IS CORRECT BEFORE SUBMITTING. DIAMOND CUT PATTERN ID WITH C/Z HEART OR CROSS FEATURE. LENGTH OF BANGLE 5.5 (14 CM). WIDTH OF BAND 3.0 MM. ID PLATE 25 X 5MM. AVERAGE WEIGHT 2.8 GRAMS. HALLMARKED BY THE LONDON ASSAY OFFICE. PRESENTED IN JEWELLERY GIFT BOX. PLU 70002 70003 70004 70005. We are dedicated to ensuring the highest possible quality service to our customers. You can send us a message by using the "Questions and answers" section towards the bottom of the page. The item "9CT GOLD BABY BANGLE ID IDENTITY BRACELET EXPANDABLE CZ HEART CROSS FREE ENGRAVE" is in sale since Thursday, October 23, 2014. This item is in the category "Jewellery & Watches\Fine Jewellery\Fine Bracelets\Gemstone". 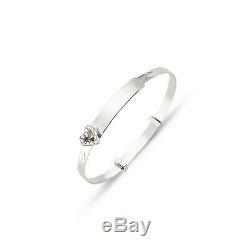 The seller is "chain_reaction_jewellers" and is located in LONDON.